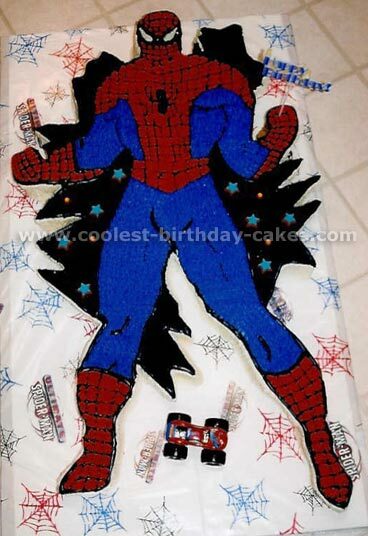 I made this Spider Man cake for my son who was turning 3 and has a very bad case of Spiderman envy, he will only answer to Spiderman at the moment. The cake went down very well and I also had lots of orders put in from all the other mothers. Firstly, I don’t bake! I order a half "plaatkoek" from our local supermarket and request that they don’t put any icing on. Then – I spend some time on the internet or coloring-in books looking for pictures. Once I’ve found something to work with, I print and enlarge to an A3. 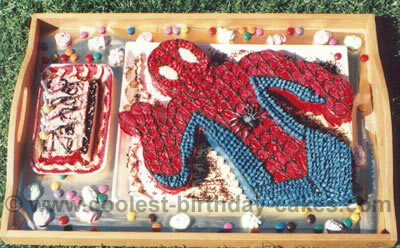 I then cut out the picture and place it on the cake, holding it with pins. I cut around the edges so that you have the basic outline. I then spread a thin layer of butter icing over the whole surface (for each cake I use a 500g brick margarine and about 1kg icing and a lot of different food colorings). Use a toothpick to make "pencil lines" for your insides. I fill in between the lines first and then do the outlines. 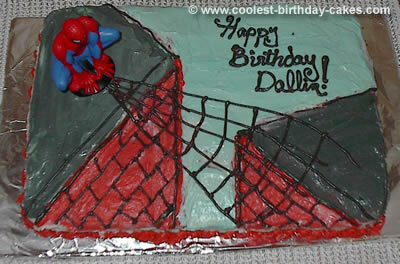 For each cake I use a 500g brick margarine and about 1kg icing and a lot of different food coloring. 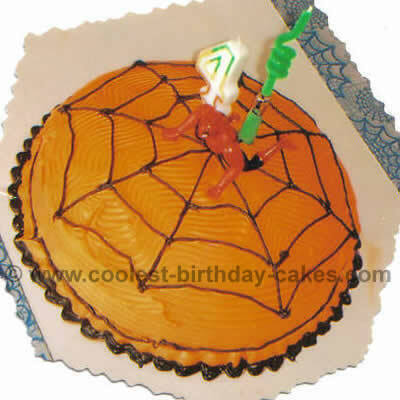 This spider man cake is simply a round cake iced in my sons favorite color- orange! 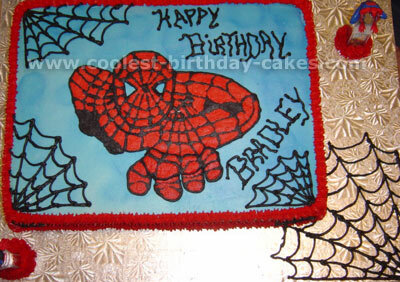 Then I piped a spiderweb on and added one of his spiderman crawling guys to the top. He loved it! 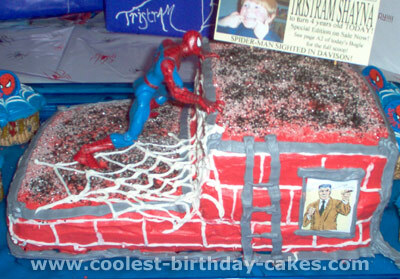 For this Spider man cake I did a follow up from a toy that my son found of Spiderman hunched down and shooting his web. We wanted something different and came up with this. I used a small tip on the decorating bag and colored frosting and there you have it! The kids all thought is was a hit!